Review: Do you like off-kilter humor and ridiculous (but great) plots? If you do, Going Bovine is for you. 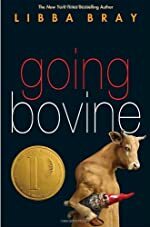 Going Bovine is the fifth book by Libba Bray, but has nothing to do with her previous four books, and a sequel is unlikely. I found Going Bovine to be a great book. It tells the story of a 16 year old Cameron (Cam for short.) He is very apathetic about life in general and very disconnected from family. Early into the book he has a series of hallucinations that he considers bad drug experiences. But after an unrelated hospital visit, it turns out he has a human form of mad-cow disease, and that he is going to die. After learning from an angel/possible hallucination that his only chance to live is to find a missing scientist, he goes out on a road trip with a close friend. The great thing about this book is the humor. While humor may be rather cynical and dark for some, those who appreciate it will find the book a classic. The greater part of the story is wonderful, with the majority being a road trip/ buddy comedy. Some of the plot points do seem a little contrived, but do not take away from the book as a whole. The book is excellently paced quickly going from page-turner to easy reading. The plot is broken up with a few welcome (and well done) interludes. Lastly, the characters feel really relatable and human. The book does have a few flaws. The ending feels very rushed and fails to clarify a few things. This would not be much of a problem if the rest of the plot was not so intricate and well done. Also, many of the minor characters start to feel one dimensional. Many more concrete readers may not be able to wrap their head around some of the book’s concepts. However, these flaws feel small compared to the greatness of the book as a whole. Review written by Colin (8th grade student). We would like to thank Random House for providing a copy of Going Bovine for this review. Have you read Going Bovine? How would you rate it? It's an amazing book, I agree completely. The ending was somewhat bittersweet and very, though not totally, unexpected. It's one of those options you never really ponder. This is one of the few books where I truthfully haven't been able to predict what happens all the time.